I was frantic today trying to (start and) finish a project I was assigned three weeks ago for a client and is due tomorrow. I know many people don't feel sorry for procrastinators like me but I really do perform better under pressure. I was trying to print out a 42-page presentation when the ink cartridges ran dry on page nine. Ugh! I have the worst technology karma of all time. [Don't even get me started on how I inadvertently erased my iPod last night and lost all the source files for my iTunes library.] So I jumped in my car and took off for OfficeMax to buy replacement ink cartridges. Which is why it's hard to explain how I found myself browsing through racks of enviable clothes at Anthropologie. I'm like an alcoholic who can't drive past a bar without stopping in for a drink — except that this "bar" is not even on the same road as OfficeMax. It's shameful, I tell you. We rely on the honeybee for one-third of our food supply. One out of three bites of food an average American eats is directly attributed to honeybee pollination. I eat a lot so for me the circumstances are probably more grave. An average honeybee produces only 1/12 (yes, one-twelfth) of a teaspoon of honey in its lifetime. Honeybee population has declined more than 30 percent in the U.S. and Europe in the last two years. A few hours later I received an email blast from Anthropologie about a new cause launched in honor of Earth Day to raise awareness of the disappearing honey bee. With a great educational e-vignette, you're introduced to the problem but, more importantly, also some solutions. Frankly, if honeybees are in danger, we're all in danger. While I was driving towards OfficeMax, I heard the radio DJ wish everyone a Happy Earth Day and honestly the next thing I knew I was in front of the store admiring the incredible window installations. Always unique and show-stopping but these particular works of art really connected with me and told a very important story of the honeybee plight. 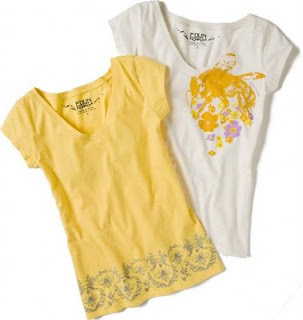 Inside I found their "Bee Tees," cute, organic t-shirts by Edun to further support this cause. I did eventually accomplish my original task and finished the presentation. But the outing inspired me. Earth Day is a wonderful reason to celebrate our planet and support efforts to ensure a sweet future for all of us, especially the honeybees. Since supper time was nearing, I wanted to create a meal to honor Earth Day's new Green Generation Campaign and the honeybee. A salad my friend Karen,who loves to cook gourmet three-course dinners — which I'm lucky enough to be invited to, made for me last week would be perfect. When I think of the phrase "Life is uncertain. Eat dessert first," I think of this salad. With caramelized fennel and pancetta served over romaine lettuce, it's a perfect combination of salty and sweet. The flavors and textures are incredible. It's like eating a three-course meal simultaneously. And if this salad doesn't satisfy your sweet tooth, by all means go out and get a pint of a Haagen-Dazs "bee-dependent" flavor. They'll make a donation to their "help the honeybees" campaign, so you can eat your dessert guilt-free. Who knew "going green" could be so sweet?! To make this more Earth-friendly, use organic ingredients. Preheat over to 400 degrees. Line a baking sheet with parchment paper. In medium bowl, toss together fennel, pancetta, garlic, brown sugar, olive oil, salt and pepper. Place ingredients on the baking sheet in a single layer and cook until the pancetta is crisp and the fennel is caramelized, about 20 minutes. Remove from the over and let cool 5 minutes. In a large bowl filled with chopped romaine, add fennel-pancetta mixture. Toss salad with vinaigrette and serve. Yields: 4 servings. Place vinegar, lemon juice and honey in a blender. With the machine running gradually add the oil. Season with salt and pepper to taste.